Patients receiving therapy services often have multiple co-morbidities that have an impact on all aspects of the therapy plan of care. This includes selection of outcome measures, choosing appropriate goals, determining duration of care, and modifying interventions to accommodate the co-morbidities. Ensuring effective outcomes requires therapy professionals to complete a thorough evaluation to determine and understand what co-morbidities the patient has and how they will affect their strength training and aerobic exercises. Not being aware of co-morbidities is a real issue and should be a great concern. 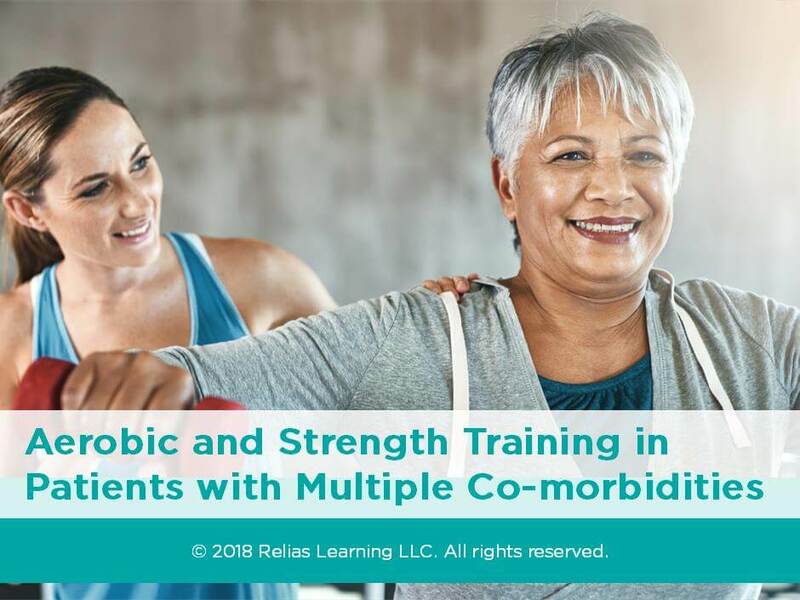 It is the therapy professional's responsibility to be aware of and understand all co-morbidities before performing exercise, whether it is aerobic or strength training. This course has been approved by the Alabama State Board of Occupational Therapy for 1.50 contact hours, approval number 20-618601. This course has been approved by the Kansas Physical Therapy Association. Approval #: . This activity is approved for 1.50 contact hours. This course has been approved by the Florida Board of Occupational Therapy for 1.50 contact hours, approval number 20-618601. Identify 5 of the most frequently occurring chronic conditions in the U.S. population that routinely impact the PT and OT plan of care. List 3-4 areas that require thorough assessment during the initial evaluation of patients with co-morbidities and explain how each impacts treatment planning. Describe one therapy consideration as it relates to aerobic and/or strength training for each of the chronic conditions discussed. Explain how co-morbidities may alter the therapist’s choice of outcome measures for assessing strength and/or aerobic conditioning. Explain how co-morbidities may alter the therapist’s goal-setting approach. The target audience for this course is: entry and intermediate level Physical Therapists; in the following settings: Rehabilitation Settings.